Hide and seek is a familiar childhood game, but it is also the name of a fun puzzle. The hide and seek puzzle consists of a grid that is divided into a range of squares. You must study the image carefully. It is composed of various different shapes and other elements to make a pictorial scene. Around the edge of the grid you will see that there are some shapes. These form part of the image. The task is to find where they appear in the puzzle and state the grid reference. Sometimes there are similar elements in different squares, so you will need to look quite carefully in order to find the correct location. Elements may even be rotated, so you might have to rotate them back in your head and they might even be reflected in harder puzzles. 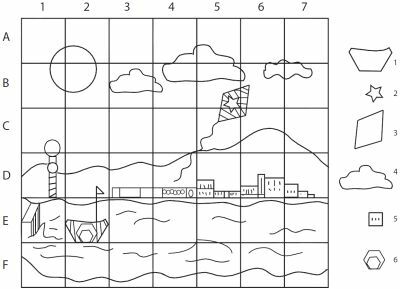 These puzzles make a great and fun addition to a puzzle page whether for children or adults, and being an inherently visual puzzle they add a graphical element to your puzzle page. This sort of puzzle is great to accompany a puzzle page containing a couple of traditional puzzle types such as sudoku and crosswords. The puzzles can even be themed based on your publication, so if your magazine is on, say, football, then a football-themed hide and seek puzzle could be created, and so on. The puzzle can be made in black-and-white like the sample, and also in colour - in the colour version the colour of the object as well as the shape can be used as part of the puzzle element. Puzzles are usually supplied in PDF format complete with solution but a range of other formats are also available if preferred. If you are interested in buying hide and seek puzzles for your publication, then please Contact Us >> with your requirements and we'll be delighted to send you further information.